Leave your workload behind in the office and get ready to escape from a dusty noisy city. 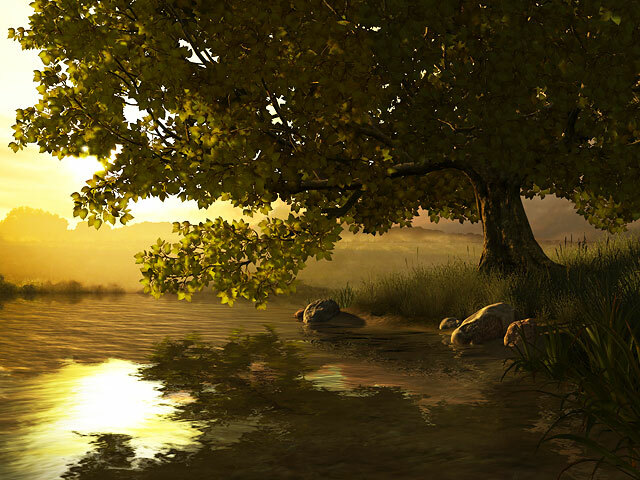 Lake Tree 3D Screensaver will help you enjoy the wind blow and see the sun shining on the crystal lake surface on a wonderful summer day. If you find yourself buried under a load of troubles and problems - take a break! With a click of a mouse Lake Tree 3D Screensaver will get you to the places where you will regain balance and let your mind rest peacefully. Listen to your heart and soul and enjoy the wonderful sacred nook of nature with Lake Tree 3D Screensaver on your monitor. Then get back to work with new creative ideas and readiness to fight the daily routine. nfsEarlyAutumnGouda free screensaver features one of the streets with a water canal in the early morning. There are no people, just water ripples, birds and butterflies revive the street. It's safe to install and run. No spy/adware.